Stout and porter are dark beers made using roasted malt or barley, hops, water, and yeast. Stouts were traditionally the generic term for the strongest or stoutest beers, typically 7% or 8%, produced by a brewery. Imperial stout, also known as "Russian imperial stout" or "imperial Russian stout," is a strong dark beer or stout in the style that was brewed in the 18th century by Thrale's brewery in London, England for export to the court of Catherine II of Russia. Left: Bottles of imperial stout. In 1781 the brewery changed hands and the beer became known as Barclay Perkins Imperial Brown Stout. 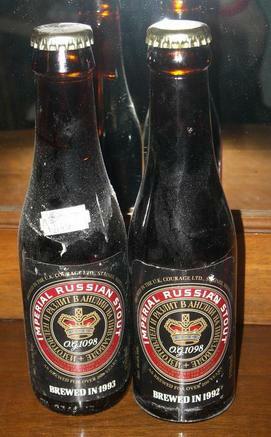 When the brewery was taken over by Courage the beer was renamed Courage Imperial Russian Stout. It has a high alcohol content - nine or ten percent abv is common. This higher alcoholic content was necessary to prevent the beer from freezing in transport, due to the colder temperatures in the Baltic. Guinness make a 7.5% version they call Foreign Extra Stout, and Boston Beer Company (Samuel Adams) makes a 9.6% version called Imperial Stout as part of their Imperial Series.